Ministry of Power and Energy :: Awarding tender for Kerewalapitiya combined duel cycled power plant with 300 MW of capacity which is operating in diesel. Awarding tender for Kerewalapitiya combined duel cycled power plant with 300 MW of capacity which is operating in diesel. 1. 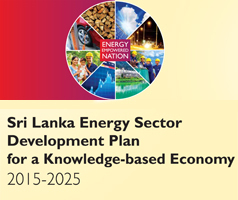 All power stations of Ceylon Electricity Board are constructed according to a 20 year long-term power generation plan approved by Public Utility Commission of Sri Lanka, in terms of the provisions of Ceylon Electricity Act No.20 of 2009. Any power station not included in this particular long-term power plan cannot be constructed. 2. According to Sri Lanka Electricity Act, no power station can be constructed without following competitive tender procedure. Even if it is a Solar Power plant with 1 MW of capacity, such power plant also can be constructed only through relevant tender procedure. If not, power will be purchased under the price approved by Cabinet of Ministers. 3. International bids were lawfully called on 16.11.2016 for the power plant with 300 MW of capacity operating in natural gas proposed to construct in 2019. Since high competition was created, around two years of period has been consumed to take a decision regarding this tender. 4. All matters related to calling tender of Ceylon Electricity Board are carried out subject to recommendations/approvals or supervisions of all institutions like Technical Evaluation Committee, Tender Committee, Procurement Appeal Board, Procurement Commission, Ministry of Finance, Cabinet Committee on Economic Development, Cabinet of Ministers and Supreme Court. 5. Therefore, 08 bids were received for this tender. After considering all the recommendations made by Technical Evaluation Committee, Tender Committee, Procurement Appeal Board, Procurement Commission, Ministry of Finance, Cabinet Committee on Economic Development and Cabinet of Ministers, it has been decided to award this tender to GCL, Windforce & RenewGen which is a local company. 6. The Cabinet of Ministers considering the inability to award the tender for the power station proposed to construct in 2019, to this company, up to 2019, has decided to award this particular tender regarding a power plant operating in natural gas with 300 MW of capacity proposed to construct by 2021 according to the said power generation plan, to Lakdanavi as which involved in this tender. All the recommendations made by Technical Evaluation Committee, Tender Committee, Procurement Appeal Board, Procurement Commission, Ministry of Finance, Cabinet Committee on Economic Development and Cabinet of Ministers within last 02 years have been considered at the time when these 02 decisions reached. 7. Action has been taken in a reasonable manner considering the all recommendations given by many committees within the procurement procedure. This is not an arbitrary decision at all. It is notable that this is a very good decision which provided opportunities for all, for a 2 years of period as government has a suitable policy which recognizes the needs of all parties. 8. Many false propagandas are being carried out through media that the relevant tender had been awarded to a Chinese Company at a high price at the time of awarding the tender. However, this Ministry seriously denies all these false statements. 9. A tender for one power station out of these has been awarded, but not to China. However, it was awarded with the involvement of all three parties namely GCL, Windforce & RenewGen which is a local Company, GE which is an American Company as its power generators are used, and a Chinese Company. 10. American Ambassador for this country also has expressed her view that this tender had been awarded in a transparent manner and she was satisfied and confident in GE Company’s technology which is an American company’. 11. Through putting these two tenders, both Lakdanavi and Wind Force which are local companies and CGL Chinese Company, Siemons German Company and GE American Company all have become partners of this tender. 12. Therefore, the false propaganda which spreads that the tender being awarded to a Chinese company is an utter fabrication. I would like to inform the public that the particular tender had been awarded to a suitable bidder, among others who had submitted their bids at lower prices, responding to calling tenders on competition.